Leonard was born in Newbury in 1887, the only child of Walter Fuller Benham (known as Fuller) and his wife Sarah (née Goodman). Sarah died within weeks of the birth, her death very possibly a result of her labour. Leonard appears in military records as Leonard John Fullwell/Fulward/Fullwood Benham, but it seems far more likely that the F in his birth registration index entry of Leonard John F stood for Fuller, after his father. Following Sarah’s death Fuller left Newbury to work as a grocer in London. Leonard was left behind in Speen, with Nathaniel and Mary Ann Browning who also looked after another child boarder, Amy Bansby. On 12 November 1893 Fuller Benham remarried, to Annie Louisa Pinn at the church of St Magdalene, Bermondsey, but this did not mean that Leonard got a new home. Leonard attended Speenhamland School, although it is not clear for how long. Eventually Sarah’s family stepped in and her younger brother Henry took Leonard in. Henry was a licensed victualler (as was his father, Thomas) so, in 1901, Leonard found himself living at the Fox & Duck in Petersham, Surrey. Fuller too, had entered the licensed trade in the 1890s taking on the Britannia Beerhouse at 234 Mile End Rd, Middlesex. Fuller, died on 8 February 1899, orphaning Leonard; probate was granted on his small estate (£35) a couple of weeks later. Leonard’s step-mother was the executor. 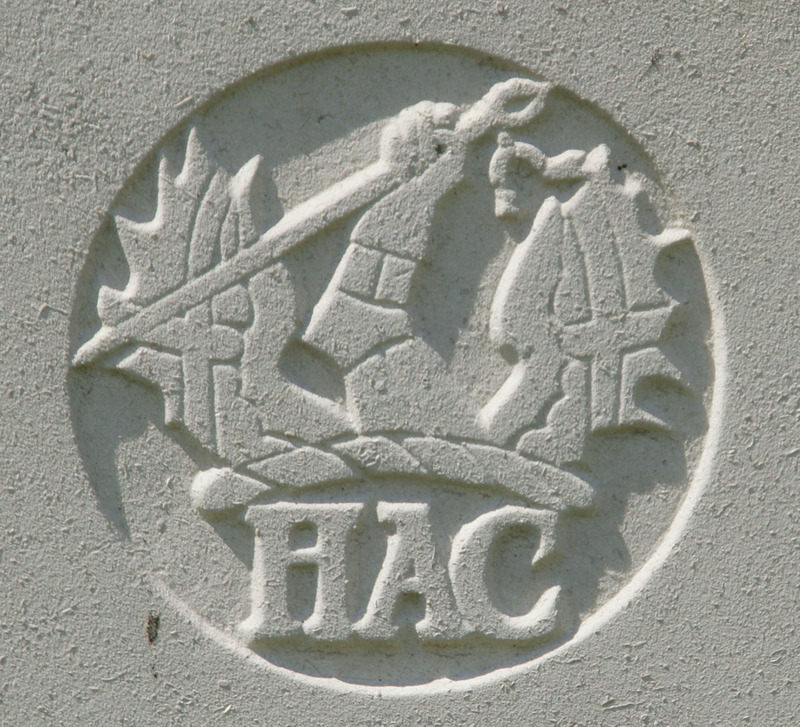 The regimental badge of the Honourable Artillery Company, as used on CWGC headstones. When war arrived in 1914 Leonard enlisted at Armoury House, Denmark Hill, London in to the oldest Army Regiment, the Honourable Artillery Company (HAC). This was a Territorial unit, which as its name suggests, included several artillery batteries, but also incorporated two battalions of infantry. Leonard was not a Territorial at the outbreak of war, he signed up on 2 September 1914, a part of the rush to serve that saw hundreds of thousands of young men like Leonard come forward to ‘do their bit.’ However, the speed at which he went through training and was shipped abroad suggests that he may have had some pre-war experience in the army. When war broke out in August 1914 the HAC and other London Territorials were mobilised; some were sent to replace regular troops in garrisons all over the Empire, but the situation in France and Belgium soon deteriorated to the extent that many reinforcements were required. The 1st/1st Battalion, HAC, was formed from members of the 1st Battalion, who volunteered to serve at the front. They were shipped over the Channel in September 1914 where they joined the 8th Brigade in 3rd Division; by the time Leonard went to France on 29 December 1914 among a draft of reinforcements the battalion had been transferred to the 7th Brigade, still in the 3rd Division. Dickebusch In billets. 12 NCOs & men from A & C Coys grenade throwing in the morning behind RE Park. Were shelled in the evening by shrapnel and had several casualties. Fatigue parties 50 from each company carrying material to the trenches. Casualties Pte L J Benham, A Coy, killed. Sergt FT Galloway, Cpls S P Rigden, H S Stephens, Ptes J A B Paul, L H Shelley, A Civeal, C S Kerin, D Y Budibent, P R Dodd & E B Dodwell D Coy. Leonard was the only one to die that day. He was buried in grave D.27 at Dicklebusch New Military Cemetery. 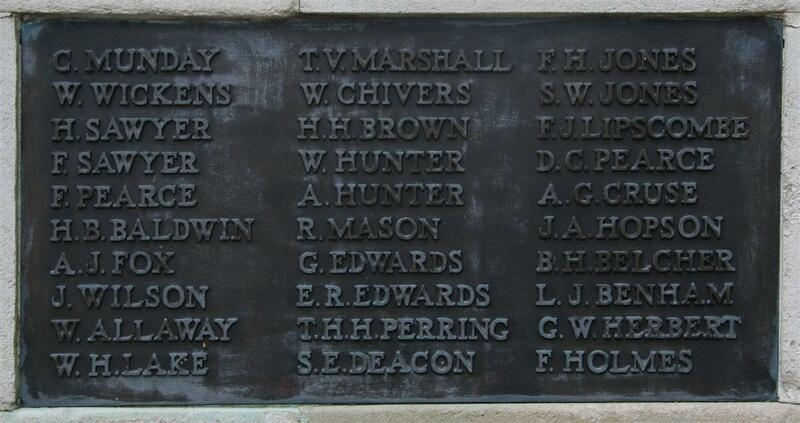 Locally he was remembered on the long lost memorial board in Speenhamland School and on Tablet 3 of the Newbury Town War Memorial.